Singaporean students being examined after a rescue mission for climbers who were stranded on Mount Kinabalu following a 6.0-magnitude earthquake in Sabah. Search and rescue (SAR) teams found 5 more bodies at Mount Kinabalu following Friday’s earthquake that hit Ranau. – Pic courtesy Malaysia Information Ministry Of Sabah, June 7, 2015. 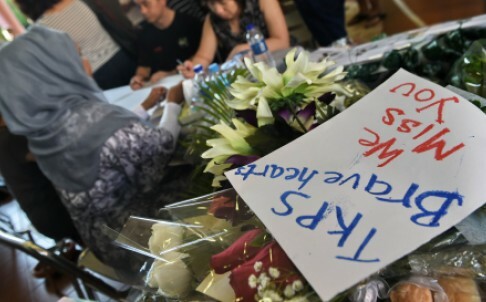 Singapore has declared Monday a day of national remembrance after six primary school students and one teacher from the city state were among 16 people killed during an earthquake that rocked Malaysia’s Mount Kinabalu. State flags on all government buildings will be flown at half-mast and one minute of silence will be observed in what has been called “Singapore’s tragedy in Sabah”. Malaysian officials said the death toll from the earthquake that struck on Friday morning had risen to 16, from an earlier 13, with 2 still missing. The Singaporean students were part of a school excursion to the popular climbing destination, which was jolted by a 6.0-magnitude quake just as the 4,095-metre-high mountain was crowded with hikers. The tremor triggered thunderous landslides that obliterated sections of trail on the peak, located in the state of Sabah on Borneo island. Singapore’s government also has said a teacher and a Singaporean adventure guide perished, while another student and a teacher remained missing. Malaysian officials have said the students were aged 12 and 13. Singapore Foreign Minister K. Shanmugam in a Facebook posting, called the episode “Singapore’s tragedy in Sabah”. “Looking at the photos of these children — such young lives, full of promise, snuffed out,” Shanmugam said. Malaysian police say the dead or missing also include 6 Malaysians, and one each believed to be from China, Japan and the Philippines. But they were yet to provide a detailed breakdown, saying the poor state of some remains made identification difficult. Mohammad Farhan Lee Abdullah, police chief of the town of Ranau near the mountain, said body parts had been found on sections of the mountain, suggesting the awesome power of the landslides. “They are in parts probably because of rocks and boulders falling on them but we need to do forensics first,” Mohammad Farhan said. Singapore’s Straits Times newspaper said some of the Singaporean students were taking a route to the summit known as the Via ferrata, Italian for “iron road”, that traverses a steeply sloping rock face. “Initial investigations show that the worst-hit area was at Via ferrata. There were many boulders that came down there,” Masidi Manjun, tourism minister for Sabah state, said. Friday’s quake was one of Malaysia’s strongest in decades but there have not been any reports of major damage, nor any casualties outside of those at Mount Kinabalu. Climbing has been suspended for at least 3 weeks so authorities can make repairs and assess safety risks. Around 20,000 people complete the relatively easy climb each year. Mount Kinabalu is sacred to the local Kadazan Dusun tribe. The foreigners, who included two Canadians, two Dutch and a German national, broke away from their entourage and stripped naked before taking photos at the mountain peak on May 30, officials have said. Five of the tourists are believed to still be in Malaysia and will be barred from leaving on the offence of gross indecency, according to police. I can understand why locals were upset. But for Sabah Deputy Chief Minister Joseph Pairin Kitingan to blame the Mount Kinabalu tragedy on a group of foreigners who posed naked is as ridiculous as blaming partying foreigners for the deaths of 230,000 people in the 2004 Indian Ocean Tsunami. ← San Andreas earthquake film: what is fact and what is fiction? Is it an ironic prediction of the “big one”?